A solar system is star system which contains all planet, asteroids, moons or small debris and comets. They all revolve around particular star in an elliptical pattern. Maximum every star has its own solar system and there are millions of billions of stars in our milky way galaxy and other galaxy which has solar system. Its not about one star, some solar system has two or three stars in solar system and because of that there is never night on their planet. About 4.5-billion-year-old is our solar system when every thing was gas and cloud around our Sun. At the center, gravity pulled more and more material in. Eventually the pressure in the core was so great that hydrogen atoms began to combine and form helium, releasing a tremendous amount of energy. With that, our Sun was born, and it eventually amassed more than 99.85 percent of the available matter. And then after many collisions between greater mass and small debris to form new big planet. According to scientist the first planet to formed in our solar system was Jupiter and followed by Saturn. When all 8 planets formed then only hard and rock, solid planet withstand the heat of Sun and called inner terrestrial planet. Other than Jupiter, all are called gas giant planet. As, we still don’t know that Jupiter has solid center or just a gas planet and same for others. Neptune and Uranus are ice cold planet with temperature below -150˚C . Fact: Other than Earth where life could possibly start is on Titan (moon of Saturn) which has a dense atmosphere and have proof of liquid surface. From NASA the Planet is : This seemingly simple question doesn’t have a simple answer. Everyone knows that Earth, Mars and Jupiter are planets. At least, they are for now. Both Pluto and Ceres were once considered planets until new discoveries triggered scientific debate about how to best describe them—a vigorous debate that continues to this day. The most recent definition of a planet was adopted by the International Astronomical Union in 2006. The planet must orbit a star (in our cosmic neighborhood, the Sun). 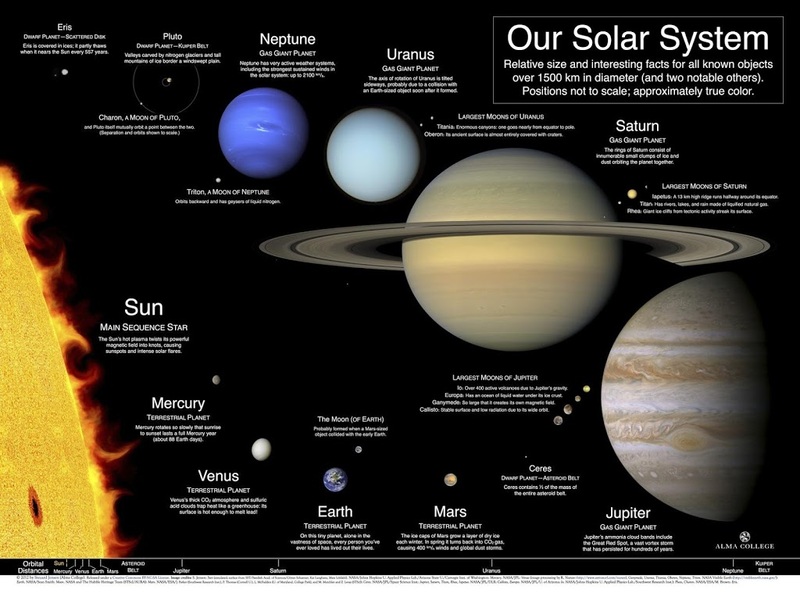 Fig: Relative sizes of solar system planets. Over historical time, objects categorized as planets have changed. The ancient Greeks counted the Earth’s moon and Sun as planets along with Mercury, Venus, Mars, Jupiter, and Saturn. Earth was not considered a planet. But rather was thought to be the central object around which all the other celestial objects orbited. The first known model that placed the Sun at the center of the known universe with the Earth revolving around. It was presented by Aristarchus of Samos in the third century BCE, but it was not generally accepted. It wasn’t until the 16th century that the idea was revived by Nicolaus Copernicus. By the 17th century, astronomers (aided by the invention of the telescope) realized that the Sun was the celestial object around which all the planets revolve. Including Earth—orbit, the moon is not a planet, but a satellite (moon) of Earth. Uranus was added as a planet in 1781 and Neptune was discovered in 1846. Pluto, discovered in 1930, was identified as the ninth planet. But Pluto is much smaller than Mercury and is even smaller than some of the planetary moons. It is unlike the terrestrial planets (Mercury, Venus, Earth, Mars), or the gas giants (Jupiter, Saturn), or the ice giants (Uranus, Neptune). Charon, its huge satellite, is nearly half the size of Pluto and shares Pluto’s orbit. Though Pluto kept its planetary status through the 1980’s, things began to change in the 1990’s with some new discoveries. Then, in 2005, a team of astronomers announced that they had found a tenth planet. It was a KBO similar in size to Pluto. People began to wonder what planet-hood really means. Just what is a planet, anyway? Suddenly the answer to that question didn’t seem so self-evident, and, as it turns out, there are plenty of disagreements about it. The International Astronomical Union (IAU), a worldwide organization of astronomers. It took on the challenge of classifying the newly found KBO (later named Eris). In 2006, the IAU passed a resolution that defined planet and established a new category, dwarf planet. Eris, Ceres, Pluto, and two more recently discovered KBOs named Haumea and Makemake. These all are the dwarf planets as recognized by the IAU. There may be another 100 dwarf planets in the solar system and hundreds more in and just outside the Kuiper Belt.